As one of his DT I was lucky enough to get my little old effort used in the article, how cool is that! Apologies for the lack of a Copics colour list, I had to get this done in a hurry to beat the publishing deadline, but oh boy I had fun adding texture and depth with a mixture of Copic techniques, gel pens and glitter, not to mention the beautiful die cuts from Memory Box and Die Namics. The Penguin hat and scarf is really simple - just dots of a slightly darker colour on top of a pre-coloured image. For the Polar Bear I just built up layers of dashes, starting with the palest greys and working up to the darker ones. As you can see the knack is to be brave and leave gaps between your pen strokes. I've found this method the best for me to get fur, try it out for yourself, I'd love to hear how you get on and whether it works for you too. As for the dies, although I used the Snowflakes Corner die, I opted to resist the urge to place it in the corner of my card, using it instead to break up the straight lines of the central image. 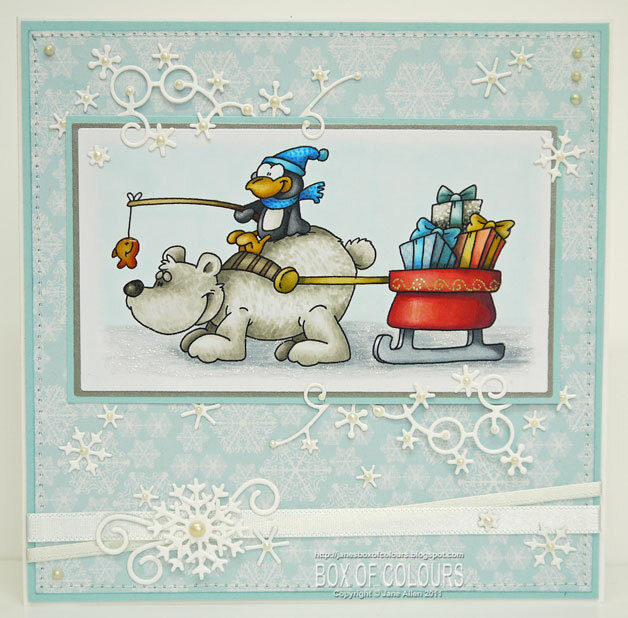 Yes it means a lot of the die is hidden behind the penguin but it sort of works - what do you think? Ribbons, Snowflake paper, machine stitching, glitter glue and a Viva Decor Pearl pen finished it off. If you like this image and others I've posted lately why not pop over to Doodle Dragon Studios and see what digi's Dustin's been doodling. Cute image and coloured to perfection! Congratulations on the publ.! Satisf.-ing moment! THis is adorable Jane! I love how you do Dustin's images, congrats on being featured, thats awesome! Ps I have candy on my blog too! Thanks for sharing your copic techniques Jane. When I grow up I want to be just like you and Jenn..
PS: thank you for commenting on my blog as well! aw that is too cute!! I love those delicate die cuts too! congrats on getting published, gorgeous colourwork and a your blog is wonderful! I like it! Awww...so cute! Your colouring is fabulous too!